Baking is often associated with comfort food. 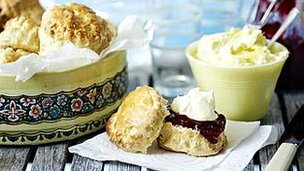 Conjuring up homemade scones, chocolate brownies, macaroons or cupcakes has become a bit of a trend of late. But is there therapeutic value that is beneficial to mental health? “Baking helps lift my depression. It can’t cure it but it helps,” says John Whaite, last year’s winner of The Great British Bake Off. He was diagnosed with manic depression eight years ago. Whaite explains that baking is a way to turn manic, erratic negative energy into something constructive. He found it an effective way to manage his condition. Whaite has eschewed prescribed medication but has tried other traditional treatments including talking therapy and exercise sessions. He’s included a chapter on the recipes he uses to help lift his spirits in his latest cookbook and he’s a supporter of The Depressed Cake Shop – a mental health charity initiative set up by the specialist food creative consultant Emma Thomas, aka Miss Cakehead. The Depressed Cake Shop ran a series of pop-up cake stalls across the country earlier this month that sold only grey cakes. The stunt raised thousands of pounds for mental health charities and provided an unusual platform for people to discuss mental health issues. 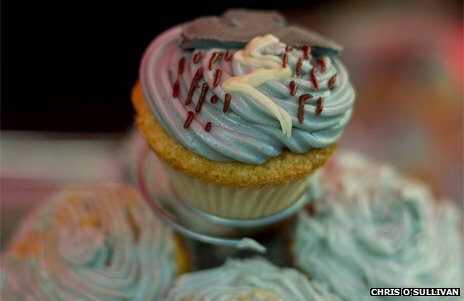 Melanie Denyer, the host of London’s Depressed Cake Shop in Brick Lane, says the success of the event was phenomenal. “For a lot of us involved in this project, mental illness and baking are linked. A lot of us turn to baking when we’re feeling low. Some of us even started baking because they were ill and needed something simple as a focus. And there is genuinely something very therapeutic about baking. “I have, for years, turned to my kitchen and cooked, savoury or sweet, because I get some relief in the creation of something that, in and of itself, is goodness, love, nurture – sometimes even beauty – when all I feel I am is ugliness, pain and a drain on all around me,” she says. Denyer has struggled with mental health problems for 15 years and was recently diagnosed with borderline personality disorder. She sees a psychiatrist and has taken anti-depressants. East London NHS Foundation Trust is one mental health provider that has experimented in cooking therapies. Earlier this year they launched Recipes of Life, an integrated talking therapy with healthy cooking and eating sessions. Dr Mark Salter, a consultant psychiatrist working in east London, says baking and cooking are good occupational therapies that help patients develop planning skills, short term memory and social skills – all of which suffer in mental illness. He says baking is particularly powerful because of its symbolism in our culture – associated with nurture and goodness. But Dr Cosmo Hallstrom, fellow of the Royal College of Psychiatrists, cautions that it is difficult to measure the precise benefits of baking as a therapy. “Any structured non-stressful activity will help depression and increase well-being. Traditional occupational therapies generally work on a physical or projection platform. “For example, exercise sessions increase physical well-being and release endorphins that combat depression. Art therapy helps a patient project their depression through creating artwork; thereby helping a patient to better understand their condition. Baking can be seen as operating on both these platforms,” he says. There is a physical element to baking – kneading the dough or cutting out cookie shapes. But there is also a strong creative or artistic component – the intricate decoration of cakes or biscuits.